Enecharger 90W in-car laptop power supply: 11-15V input, 14-24V output with additional USB-A output. DC output port automatically delivers 14V-24V 6.0A max. 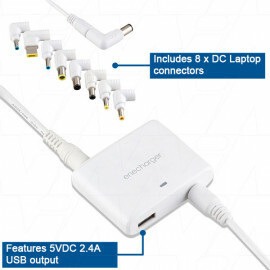 output at the ideal voltage required to charge many laptops and notebooks from Dell, HP, Acer, Asus, Lenovo and many more using the included DC output cable plus 8 x laptop connector tips. 5V 2.4A max. USB-A output port to charge mobile devices. Charging cable required (not included). Easy to use, automatic setup. Just plug in for instant power. Built-in over current protection, over voltage protection, short circuit protection, over temperature protection.